The exquisitely talented actress and artist, Jane Seymour, visited Ocean Galleries for a Memorial Day exhibition, bringing an extraordinary collection of her latest oil paintings and watercolors. “Jane Seymour: Up Close and Personal” opened Friday, May 15 and ran through Monday, May 25, 2015. 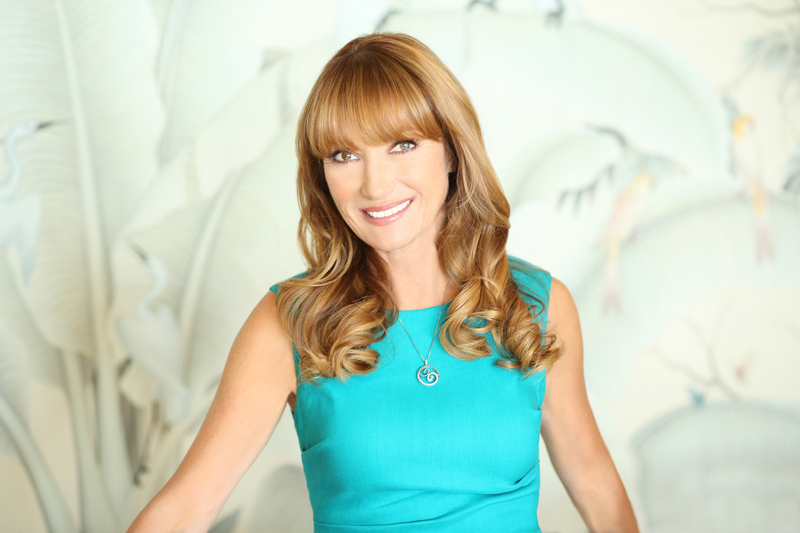 A multiple Emmy® and Golden Globe® winning actress, Jane Seymour has proven her talents in virtually all media, the Broadway stage, motion pictures, and television. The multi-talented artist has written over 10 books and launched Jane Seymour Designs, a national lifestyle brand inspired by her homes, art, and family-centered lifestyle. Seymour began painting more than 20 years ago as part of a healing process for personal challenges experienced at that time. Since then, Ms. Seymour has emerged as an established and accomplished painter, creating an intimate world of delicate watercolors, colorful vibrant oil paintings, pastels, and bronze sculptures. She has exhibited in many North American galleries, has accepted select private commissions, and continues to reach new artistic levels by constantly developing her technique, style, and subject matter. 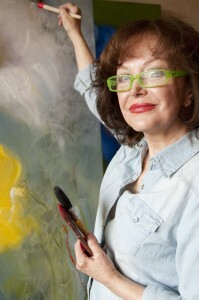 Often described as a California colorist, Ms. Seymour believes that her art reflects the essence of who she is. 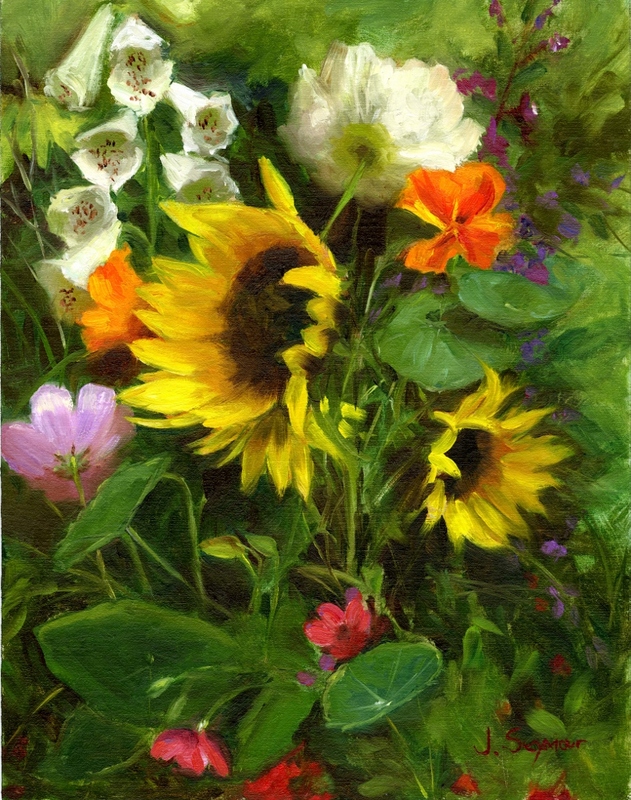 Her collection of expressive art often reflects her passions in life, such as flower gardening, which is evident in her colorful flower arrangements, detailed landscapes, and lush garden paintings and watercolors. An inspirational trip to paint in Monet’s Garden (Giverny, France) became Seymour’s personal tribute to the Impressionists, resulting in an elaborate series of paintings and watercolors depicting the famed gardens. Her Ocean Galleries exhibition also included numerous beachscapes and figurative paintings, many of which were inspired by her home life in Malibu, CA and recent visits to the East Coast. 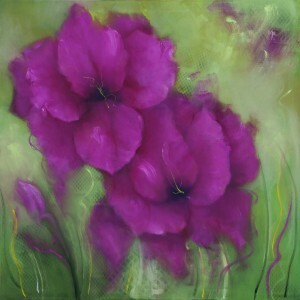 Click here to view Jane Seymour’s art. 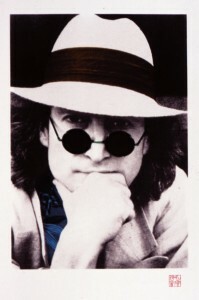 Ocean Galleries was thrilled to host an exceptional exhibition featuring the artwork of John Lennon. An unparalleled collection, “The Art of John Lennon” was on exhibit and available for acquisition from Thursday, June 18 through Monday, June 22, 2015. In his art, John Lennon, the legendary musician, songwriter, poet, philosopher, and artist, delivered a consistent message – peace and love. Like his music, his artwork celebrates human love and communication – two themes at the heart of his contribution to the art of the twentieth century. The Artist loved both literature and visual art, studying at Liverpool Art Institute from 1957-1960. He penned and illustrated three books: In His Own White, A Spaniard in the Works, and Skywriting by Word of Mouth. As early as 1969, John began moving toward a return to visual art and continued to draw throughout his life. He was primarily interested in drawing and favored the creative loose sketch, working in pen and ink. Lennon’s primary medium was line drawing, in either pen, pencil, or Japanese sumi ink. He not only penned, but also sketched the drawings that became illustrations for his three bestselling books. The exhibition of John Lennon’s artwork at Ocean Galleries supported the artist’s philanthropic vision of a world free from hunger. Although the exhibit was free, a donation of $5 or more per person was suggested, which supported the Southern Branch of the Community FoodBank of New Jersey. Click here to view John Lennon’s art. 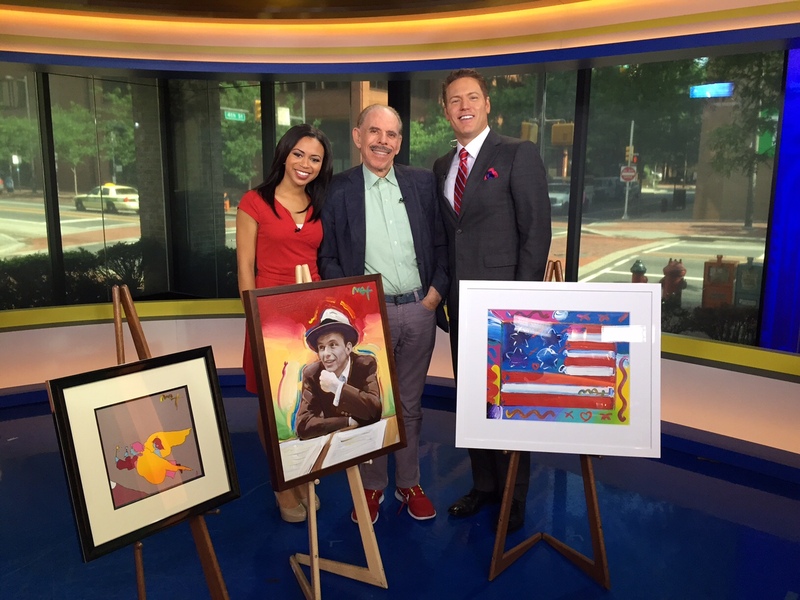 Legendary artist Peter Max returned to Stone Harbor over the Fourth of July weekend, bringing with him a never-before-seen collection of his greatest and most-revered imagery spanning four decades. The new exhibition spoke to the evolution and maturation of America’s most popular living artist, offering a journey through the career of a pop icon that has defined American art and began a new visual culture. With paintings on exhibition in hundreds of museums and galleries worldwide, Peter Max and his vibrant colors have become part of the fabric of contemporary culture. 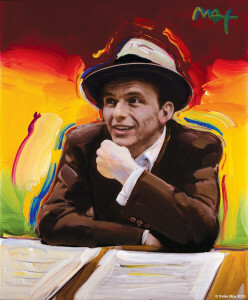 Max has been successively called a Pop Icon, Neo Fauvist, Abstract Expressionist, and the United States “Painter Laureate.” The artist has had the distinct honor of painting the last seven Presidents of the United States and the world’s best loved celebrities, among them music sensation Taylor Swift, who was first exposed to Max during her summer visits to Stone Harbor and Ocean Galleries. One of the highlights of this year’s carefully curated exhibition was his latest series of paintings in honor of the Frank Sinatra 100th Centennial Celebration. The exhibit also featured his iconic and best-known pieces, including Statue of Liberty, his famous Flag pieces, Umbrella Man and the prestigious Cosmic Runner. In addition, the exhibit featured many of his revered celebrity portraits and numerous shore-themed paintings created specifically for the Ocean Galleries event. Click here to view Peter Max’s art. Ocean Galleries welcomed Victoria Montesinos to Stone Harbor for her first exclusive art exhibition in New Jersey July 31 through August 2. The talented artist, best known for her exquisite paintings of flowers, uses a unique technique of layering to create artwork that is strikingly beautiful. Born in Mexico City, Victoria studied art with master Spanish painter Jose Bardasano, where she learned the rigorous veladuras technique of painstakingly building up texture and depth through many fine layers of paint. By introducing marble, sand, and stone as textural elements, as well as stenciling techniques, Montesinos creates a subtle topography for her floral universe. Most notably, she is able to achieve a nearly subliminal incandescence through a medieval method of applying gold leaf to the canvas before painting. Because this process is so labor intensive and time consuming, Montesinos will spend two to three weeks absorbed in a single canvas. In 1984, Victoria moved to New York City, where she studied lithography at the American Atelier and further honed her skills as an artist. Her works have been exhibited throughout Mexico, Europe, Japan, and the United States. Click here to view Victoria Montesinos’ art. Over Labor Day weekend, the quaint seashore community of Stone Harbor, NJ played host to the legacy of revered Master Impressionist Pierre-Auguste Renoir, when Ocean Galleries welcomed his great-grandson, Alexandre Renoir, for an extraordinary exhibition of his impressionistic paintings. In addition to viewing his incredible artwork, guests had a chance to witness Alexandre Renoir’s extraordinary talents as he painted during the gallery’s special receptions in his honor. Inspired by his famous great-grandfather, Alexandre has created his own unique style of painting using impressionistic techniques. One of the most popular art forms, Impressionism dates back to the 1800s. Characterized by relatively small and thin brush strokes, Impressionism accurately depicts detail, light, and movement in a bright and vibrant manner aimed at capturing the momentary, sensory effect of a scene. 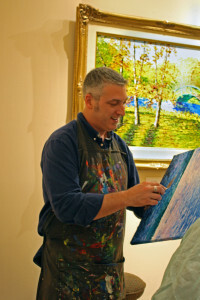 Artistically, Alexandre trained at various arts-oriented schools, including the Virginia Park School for the Artistically Gifted and the Victoria School for the Arts and Performance (Edmonton, Alberta). In addition to his formal education, he also attended classes at the Alberta Museum on Aboriginal Arts and Crafts, garnering experience in sculpture, pottery, woodworking, stone carving, commercial art, photography, and painting. Although his collection of artwork included several still lifes, many of Alexandre’s paintings were land and seascapes like his great-grandfather’s works. “I was fortunate to live in and travel to many beautiful places in my life – from where I grew up in the South of France, to where I currently reside in La Jolla, CA – so painting what I have seen and experienced is something that comes very naturally to me,” explains Renoir. 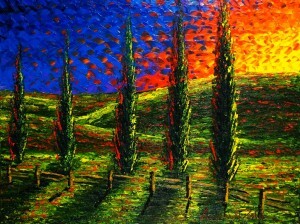 Click here to view Alexandre Renoir’s art. Ocean Galleries was delighted to host the vibrant artwork of Tom Everhart over Columbus Day weekend. Best known for his visual subject matter inspired by legendary Peanuts© creator Charles M. Schulz, Everhart enjoyed a 20-year personal friendship with the cartoonist and an artistic relationship greatly valued by both men. A mutual respect developed so powerful that Schulz encouraged Everhart to carry forward his comic strip creations to the fine art form – and to extraordinary results. Everhart would become the only fine artist to be educated by Schulz in his work and also entrusted to create Peanut’s© artwork under his direction. 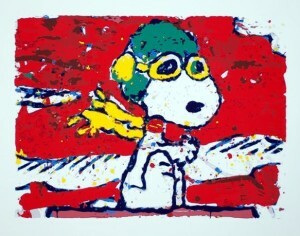 Everhart’s Peanuts© related work went on to show at the Louvre in Paris and museum and gallery shows around the world. It will now be in Stone Harbor, NJ for a special four-day exhibition. 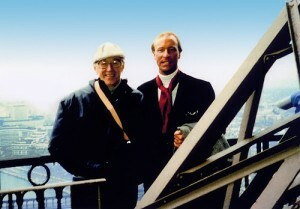 Tom Everhart with longtime friend and mentor, Charles M. Schulz. Classically trained as an artist at the Yale University of Art and Architecture, Tom Everhart graduated in 1976 and continued post-graduate studies at the Musée de l’Orangerie in Paris. His initial artwork focused on large-scale skeleton and nature-related paintings. In 1980, Tom Everhart met cartoonist Charles M. Schulz by chance when he was involved in a freelance project requiring him to draw and present Peanuts© renderings to Schulz’s studios. Snoopy developed into the famous “World War I Flying Ace” fighter pilot in constant pursuit of the Red Baron as a result of Charlie Schulz’s son, Monte’s suggestion. Having absolutely no education in cartooning, Everhart blew up some of the cartoonist’s strips on a 25-foot wall in his studio, which eliminated the perimeter lines of the cartoon box, leaving only the marks of the cartoonist. Schulz’s painterly pen stroke, now larger than life, translated into painterly brush strokes and was now a language that overwhelmingly connected to Everhart’s own form of expression and communication. Completely impressed with Schulz’s line, he was able to reproduce the line art almost exactly, which in turn impressed Schulz at their meeting. Although the commercial project would never come to be, from this meeting on, an odyssey of two artists would begin. Everhart went on to paint alongside legendary Peanuts© creator Charles Schulz and is the only fine artist educated by Schulz. While still painting full-time on his previous body of work in his studio, Everhart began drawing special projects for Schulz and United Media, both in New York and Tokyo. These authentic Schulz-style drawings included covers and interiors of magazines, art for the White House, and the majority of the Met Life campaign. When Everhart was not painting, he was considered the only fine artist authorized and educated by Schulz to draw the actual Schulz line. The paintings using Charles Schulz’s comic strip, Peanuts©, as subject matter began and replaced Everhart’s earlier skeleton and nature related paintings in 1988. In January 1990, Everhart’s Schulz related work went on to show at the Louvre in Paris and subsequently in Los Angeles at the L.A. County Museum of Natural History, in Montreal at the Museum of Fine Arts, in Tokyo, Japan at the Suntory Museum of Art, as well as Osaka, Rome, Venice, Milan, Minneapolis, Baltimore, New York, Houston, Chicago, Las Vegas, and Santa Rosa, California at the Charles M. Schulz Museum. “It seems that I am more easily explained by what I don’t have than what I do. The most misunderstood thinking about my work is that I am licensed to create the images that include the copyrighted subject matter that has so influenced me through the teachings of my greatest friend Charles Schulz. I do not have a license, and have never had one. But Sparky [Schulz] did make certain to arrange a contract early in the development of the work that permitted me to use the subject for the ‘term of my life’,” explained Tom Everhart. 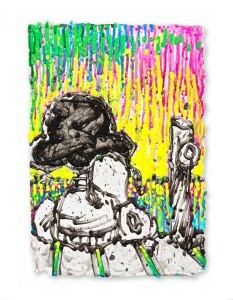 Click here to view Tom Everhart’s art.